Long and painful is the road of overcoming buzzwords and catch phrases in the interactive space. Here comes another one. Like every buzzword, there’s a slice of reality behind all the momentum and excitement. In this case we’re just scratching the surface. HTML5 isn’t brand new (W3C published the first working draft back in 2007). But in this case, there is a huge fight brewing over the future of interactivity and who owns it–and HTML5 is in the eye of the storm. 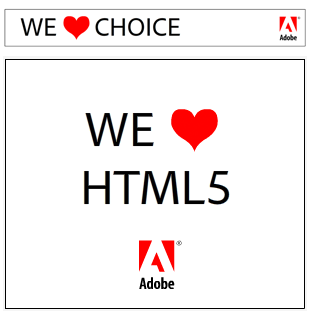 And in broad strokes the outcome of this fight will force designers to become more acquainted with HTML5. Right now the buzz will drive the change. 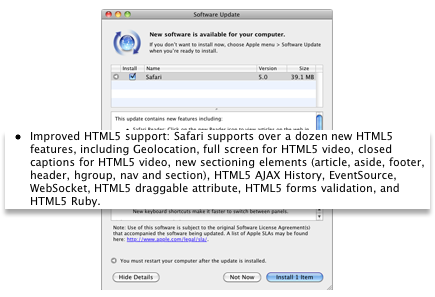 Today I updated to Safari 5, which touted many updates for better HTML5 rendering. Chrome is also on its way as well as Firefox. Internet Explorer…well…IE is IE (Microsoft claims IE9 will support HTML5, they didn’t say how they’d support it). However, when the buzz dies, and trust me it will, we’ll all land on a simple question: “Which approach is easiest to work with?” And the answer will depend on the skills of the designer. Designers have a lot of questions. Do I need a gradient to be a .png file? If I’m used to working that way, then I might not bother to learn about the programmatic way of creating virtually the same design element. Is it easier to produce and publish videos in the exact way I’ve always done (with my compression settings exactly the way I like them)? Sure it is. But one line of code may open the door to more options and time spent elsewhere (no, HTML5 doesn’t set compression settings for you). And there are also a few elephants in the closet. Will users find my content easier via SEO when text isn’t buried in an .swf or .flv file format? Can my content management system publish content to HTML or Flash better and easier? Apple’s coup d’état is, of course, will my design and interaction display flexibly on any device? (Sorry, Adobe.) These are thoughts to consider and reasons companies may want to explore what can be done with HTML5. At a minimum, learning the differences between HTML5 and 4 or HTML5 and Flash will help designers eloquently explain that HTML5 can’t drive your car, pick up your laundry, or produce instantly gratifying experiences. But please help me kill the buzzword part of it before it’s too late.